By Alastair Lee BitsoiWhen Amber Crotty decided to establish a Brownie troop at Tséhootsooí Diné Bi Olta, little did she foresee the response: Over 50 girls--about 20 percent of the student body--signed up to become members of the newly formed Arizona Cactus Pine Troop No. 3053. They ran the gamut from Daisies (grades K-1) to Cadettes (grades 6-8), as the ages are grouped in Girl Scout parlance.And:Crotty, who together with co-leader Nikki Alex started organizing the troop in November, said the strong response indicates a need for after-school programs not just at the Navajo language immersion school, but in most other schools as well. "I wanted to learn more things about nature," said Eriona Tapahe, 11f, a cadette. 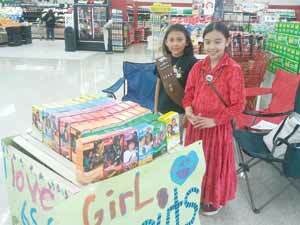 "I was excited because I haven't been in the Girl Scouts before, and wanted to try it. "Comment: Should every child be enrolled in some kind of after-school activity? Hmm...it might help. For more on Scouts and Indians, see Boy Scouts Build Chumash Village and Boy Scout Dances at Powwow.